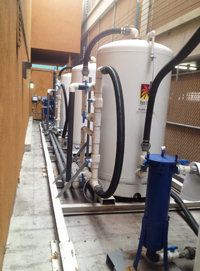 Environmental Remediation/Filtration Solutions, Turnkey Project Management, Environmental Equipment Sales - Fullerton, Santa Ana, Anaheim | Pure Effect, Inc. Pure Effect, Inc. sells and rents treatment equipment & provides services for construction projects, stormwater systems for industrial & construction SWPPP, industrial facilities and many other environmental applications. We offer turnkey onsite services & project management for Groundwater Remediation Systems, Construction Dewatering Treatment Systems, Industrial Wastewater Treatment Systems, Greywater Filtration Systems, Industrial & Construction Stormwater Treatment Systems, SVE (Soil Vapor Extraction) Systems, NPDES and Industrial Sewer Discharge Permitting and VOC Odor Control Refillable Carbon Panel Systems. In addition to our remediation and filtration systems, we also offer discharge permitting, engineering design, vacuum & rebed services, bulk activated carbon sales, air purification HVAC services, specialty impregnated carbon sales and Hazardous & Non-Hazardous transportation services. We service Southern and Northern California, Nevada, Arizona and Oregon with our rental systems and we manufacture our equipment for lease or purchase throughout all the world. We also have partnered with many companies across the United States in order to offer one solution to all of your Environmental needs. For over 25 years Pure Effect has been designing and installing treatment systems and our experience along with our large inventory will assure your project is handled right the first time. Pure Effect Environmental is happy to provide you with a quote for your project. Simply complete this RFQ form.